This is a step by step guide to getting started with LibPQ, an illustrated version of "Installation and usage" section of the official documentation. The source code of the library has to be present in each workbook that uses it. 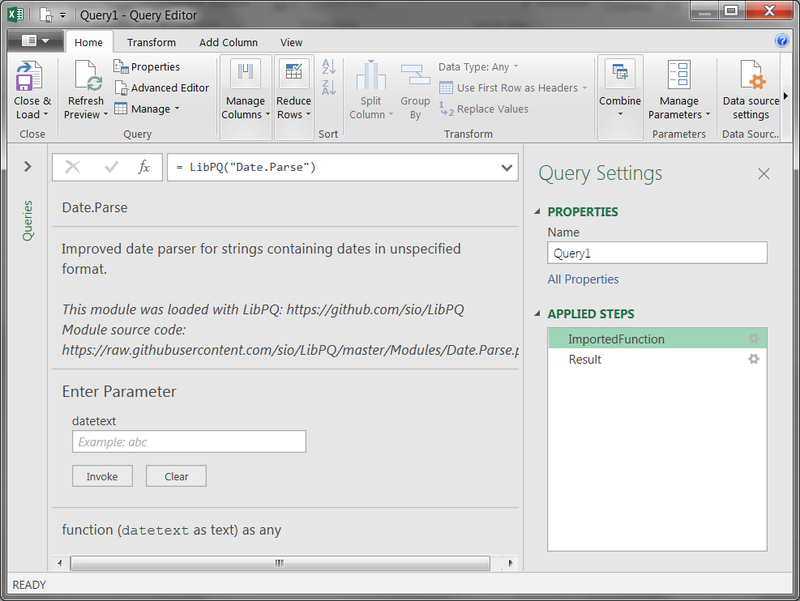 Copy the contents of LibPQPath-sample.pq and modify it in Advanced editor. LibPQ will search for your modules first in local directories (in order they are listed), then in web locations. If the module is found, no further locations are checked. If your friend adds a module with the same name to their collection, all you need to do to ignore it is to make sure that your collection address is higher in the LibPQPath than your friend's. That works both ways: you and your friend can continue sharing your module collections while using personal modules with colliding names without any problems. It is not necessary to repeat the installation steps every time you want to use LibPQ. You can add LibPQ to an empty workbook and save is as a template for future use. 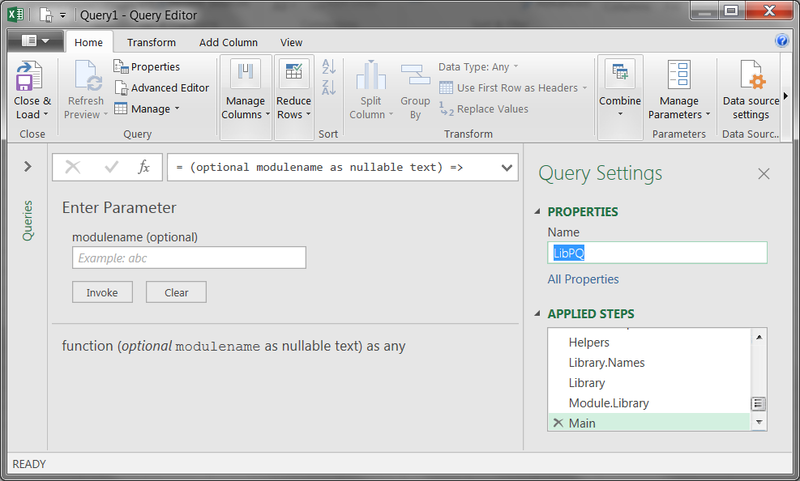 Import any available module with LibPQ("ModuleName") when writing your queries in Advanced editor. LibPQ will search for the file named ModuleName.pq in all locations that you've listed in LibPQPath. 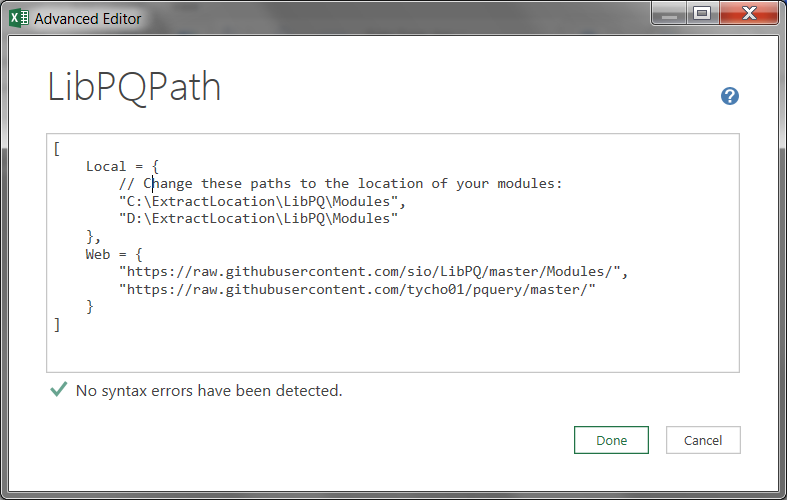 If the module is found, its source code will be evaluated and the result will be returned. That works because LibPQPath contains reference to https://raw.githubusercontent.com/sio/LibPQ/master/Modules/, where the source code for Date.Parse.pq is located. If you have any further questions about LibPQ please create an issue on GitHub or contact me via e-mail.